Rob Zombie is an American musician, film director, screenwriter, film producer, and now electronic dance music curator. The horror-loving Zombie has created a four-week EDM-focused event series entitled Rob Zombie’s Great American Nightmare. As you can guess by the title and Rob Zombie&apos;s previous work, the events will feature some of the heaviest music around. Zombie will be bringing heavyweights like Doctor P, Dirtyphonics, Terravita, Zomboy, Evol Intent, and DJ Bl3nd, to thoroughly punish you with bass. Zombie is also setting up three haunted houses based on his films to liven up and emphasizes the full experience that is his nightmare. 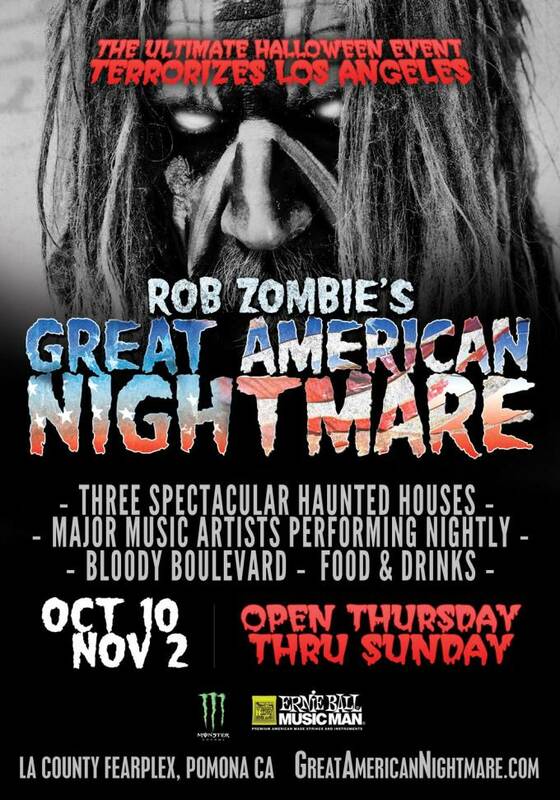 Tickets for Rob Zombie’s Great American Nightmare are available now starting at $30 for Thursday or Sundays and $35 for Friday or Saturdays at GreatAmericanNightmare.com. Each ticket includes access to all haunted house attractions, concerts and the Bloody Boulevard activities. Tickets will also be available for purchase onsite during the Los Angeles County Fair at Pomona Fairplex (August 30-September 29). VIP packages will be available for purchase at GreatAmericanNightmare.com.